Recombinant Human cytomegalovirus (HCMV) Glycoprotein B /gB Protein, C-His Tag (rh CMV-GB His Chimera) Val 23 - Lys 700 (P13201-1) with furin cleavage site mutated from 'RTKR' to 'TTQT', was produced in human 293 cells (HEK293) at ACROBiosystems. The protein has a calculated MW of 93.7 kDa. The protein migrates as 116-130 kDa under reducing (R) condition (SDS-PAGE) due to glycosylation. 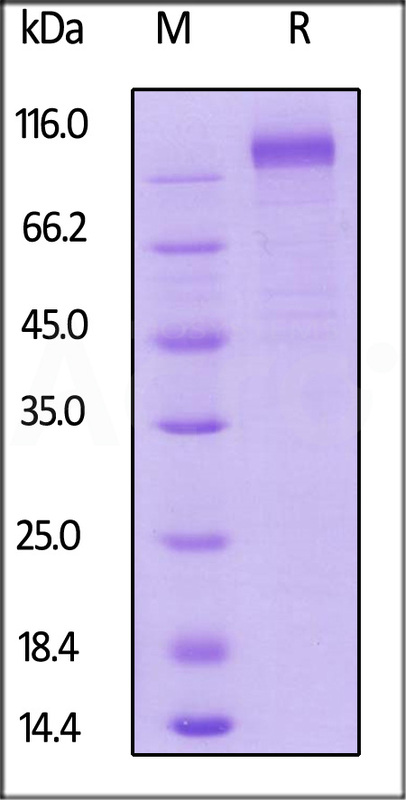 HCMV Glycoprotein B (gB), His Tag on SDS-PAGE under reducing (R) condition. The gel was stained overnight with Coomassie Blue. The purity of the protein is greater than 80%. Human cytomegalovirus is a species of the Cytomegalovirus genus of viruses, which in turn is a member of the viral family known as Herpesviridae or herpesviruses. It is typically abbreviated as HCMV or, commonly but more ambiguously, as CMV. CMV Virus Envelope Glycoportein B (CMV-GB) can be cleaved into glycoprotein GP55. Envelope glycoprotein that plays a role in host cell entry, cell to-cell virus transmission, and fusion of infected cells. CMV-GB may be involved in the initial attachment via binding to heparan sulfate together with the gM/gN complex that binds heparin with higher affinity. Furthermore, CMV-GB can interact with host integrin ITGB1, PDGFRA and EGFR that likely serve as postattachment entry receptors. Also, CMV-GB participates in the fusion of viral and cellular membranes leading to virus entry into the host cell. Membrane fusion is mediated by the fusion machinery composed at least of gB and the heterodimer gH/gL. (1) Wang X., et al., 2002, Nature 424:456-461. (2) Feire A.L., et al., 2009, J. Virol. 84:10026-10037. (3) Halary F., et al., 2001, Immunity 17:653-664.